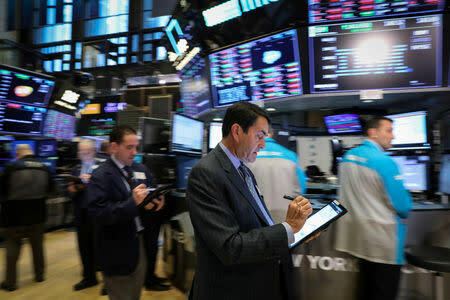 NEW YORK (Reuters) - Wall Street led global stocks higher on Thursday on the back of upbeat economic data, while the dollar rallied despite the Federal Reserve's uber-dovish stance as Brexit worries weighed on the euro and sterling. The British currency tumbled 0.73 percent against the U.S. dollar on a rising probability of a "no-deal" Brexit that would likely slow economic growth. A day after the Fed flagged an economic slowdown, U.S. data showed jobless benefit applications fell more than expected while mid-Atlantic factory activity rebounded, triggering gains in technology stocks, and the Wall Street benchmark closed at its highest in over five months. MSCI's gauge of stocks across the globe gained 0.68 percent and emerging market stocks rose 0.11 percent. Brazil's stock benchmark fell sharply after former president Michel Temer, who left office three months ago, was arrested as part of the sweeping anti-corruption "Car Wash" probe. The Bovespa fell 1.3 percent while the Brazilian currency lost 0.64 percent at 3.7995 per dollar. Benchmark Treasury yields briefly touched their lowest since early 2018 and the yield spread between the three-month Treasury bill and the 10-year note shrank to its narrowest since August 2007. A narrow spread between the two yields indicates increased market expectations of a recession. "The Fed has doubled down on its dovish tilt," said Matt Freund, head of fixed-income strategies at Calamos Investments. "The global economy is clearly softening and the Fed is looking at liquidity conditions." Benchmark U.S. 10-year notes last fell 1/32 in price to yield 2.5387 percent, from 2.537 percent late on Wednesday. Three-month bills were yielding 2.4175 percent. The 30-year bond last rose 7/32 in price to yield 2.9651 percent, from 2.975 percent late on Wednesday. The U.S. dollar recouped the ground lost in the previous session after the dovish Fed's statement. Sterling continued to fall with the rising likelihood of a no-deal Brexit. European Union leaders wrangled over what kind of delay to offer Britain as it looked less likely that Prime Minister Theresa May can convince parliament to ensure an orderly withdrawal. The pound was recently trading at $1.31, down 0.69 percent on the day. The dollar index rose 0.63 percent, with the euro down 0.35 percent to $1.1371. "The focus shifted back to Brexit and the potential downside that a 'no deal' would create," said Minh Trang, senior currency trader at California's Silicon Valley Bank. Norway's currency shot up after its central bank, going against the grain, raised interest rates and signalled a 50-50 chance another hike will follow by mid-year. The Norwegian krone gained 0.56 percent versus the U.S. dollar at 8.46. Oil prices fell after touching their highest in 2019. U.S. crude fell 0.7 percent to $59.81 per barrel and Brent was last at $67.64, down 1.26 percent on the day. Spot gold dropped 0.2 percent to $1,309.27 an ounce. Copper lost 0.38 percent to $6,432.50 a tonne.